Over the past year, Ubisoft have treated us to a few wonderful games using their proprietary UbiArt Framework engine, the most recent of which was the phenomenal Child of Light (read our review here). 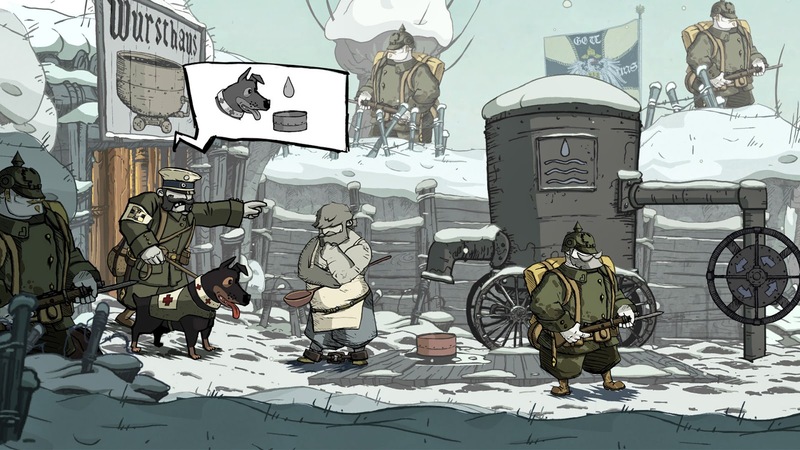 Valiant Hearts: The Great War, a 2D adventure/puzzle game set in and around France, tells the intertwining stories of a few brave individuals in World War I, and is the latest title to utilise the aforementioned engine. Does it live up to the ridiculously high standards set by the previous UbiArt titles? Read our full review below for the verdict. You start the game playing as Emile, a hardworking French farmer, content with his rural life. He lives with his daughter Marie, her husband Karl, and their baby son Victor. Unfortunately, Karl is German, and is therefore taken to fight with his homeland's army. It's not the last you see of Karl, as he is eventually a playable character. Emile is also called upon, and with a heavy heart he leaves not only his farm, but Marie and Victor. On his way to the frontline, he meets an American named Freddy, who is to become one of his truest friends. Soon, you meet a medic named Anna, who doesn't discriminate at all. She will help anyone in need, regardless of which flag they bear. And that wraps up the roster of playable characters. You'll fall in love with each of them for different reasons, but they all share one simple trait: kindness. This unlikely group tasks themselves with finding Karl, and reuniting him with his wife and son in Saint Mihiel. Along the way, they all perform great acts of bravery to help their fellow humans, and that is what makes this a war game unlike any other. Instead of shooting anything that moves, you often sneak past enemies or find another route, killing only when absolutely necessary. To make this a bit easier, Emile adopts a trained dog, whose owner lost his life in an artillery strike. He can squeeze into tight spaces, retrieve items, rescue injured people, and distract the enemy, meaning you can get past without resorting to violence. Throughout the game, you're introduced to many different gameplay mechanics. It mainly comprises of puzzles, though they never get repetitive. You'll use many different techniques to solve the puzzles, and they're all very satisfying to solve. Other than that, there is stealth, a few driving sections, and when playing as Anna, there are QTEs for healing people. Considering it's a fairly short game, and a lot of mechanics, none of them feel out of place. Ubisoft Montpellier have done a fantastic job on every aspect of the game. Sometimes it feels like the game is walking you through each step, but you can turn on Veteran mode in the options, which takes away all of the hints and it feels like this is the way the game is meant to be played. I would recommend turning it on before you even start the game. As is the case with all UbiArt games, the visuals are very unique. It looks like a graphic novel in motion, it really is beautiful. The characters have a very distinctive, adorable style, which is a massive juxtaposition with the war setting. Despite all of the death and sadness, the game has a wonderful sense of humour, and it's this that makes the story so real. 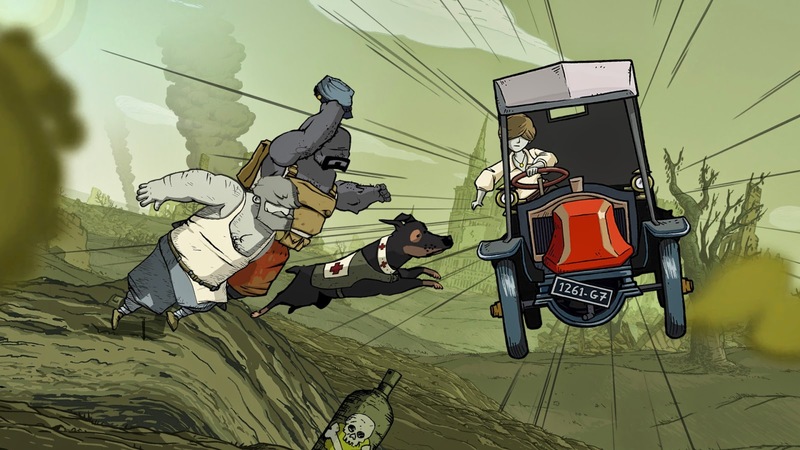 Humans need to laugh in the darkest of times, and Valiant Hearts shows us this in the best way. It shows the most human and relatable sides of the war, the bits that are often overlooked. Ubisoft Montpellier have delivered one of the most moving war stories ever told in gaming. Relatable characters, who just want to help people in the darkest days of their lives, and a believable story (which is based on actual letters sent during WWI) make Valiant Hearts: The Great War a truly unforgettable experience. It's amusing, shocking and heartbreaking, and it shows a side of war that games rarely do in an often overlooked, yet incredibly important part of history. You should absolutely play this game.